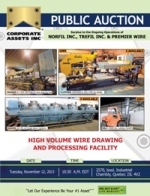 Corporate Assets Inc. | Norfil Inc., Trefil Inc. & Premier Wire - Corporate Assets Inc.
HIGH VOLUME WIRE DRAWING AND PROCESSING FACILITY FEATURING: VAUGHN 6/7 HRD MOTOBLOX wire drawing line with inlet wire dia. .220" (5.5mm), outlet: .062" (1.5mm), 30/40/50 HP, deadblock coiler, speed: 625/2500 FPM, payoff tower & wire sheave guide, TAINAN CHENG MD-7 mechanical/ brush descaler, dust collector & PLC electrical controls; VAUGHN 7/8HRS wire drawing line with inlet wire dia. .220" (5.5mm), outlet, .062" (1.5mm), 35 HP DC motors, 3500 FPM, VAUGHN drawing deadblock, tower payoff & descaler; VAUGHN 5/3HR MOTOBLOX rod breakdown machine; VAUGHN 4H MOTOBLOX rod breakdown machine; (2) EMC wire drawing lines with payoff tower, wire sheave guide, mechanical/ brush descalers, dust collector; ICE wire pickling line; (2) CLIFFORD (1999) VERSAWELD 2012 CNC jig welders with 79" X 48" max. part dimension; PEARSON 8' X ½" hydraulic shear; REED 125 thread roller; GSG mechanical/ brush descaler; HELI (2004) 15000 lbs. outdoor forklift with full cab enclosure, LARGE OFFERING of motors and machine spare parts, trailers, and MORE!